Dental damage can happen to anyone, and whether it’s caused by severe decay or a sudden injury, what’s most important is having a trusted dentist who can provide you with the skilled support you need. Here in Tullahoma, TN, Dr. John Petty and our team are happy to offer restorative solutions that provide both lasting durability and aesthetic quality. With several materials available for your new crown or bridge, including gorgeous porcelain and ceramic, your smile can seamlessly recover from broken enamel, large cavities, and even teeth that are missing altogether. 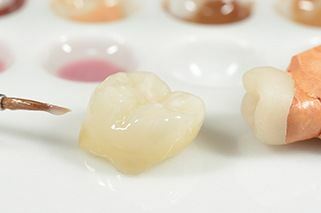 Dental crowns are an important cornerstone of restorative care, and they can be used in a wide variety of situations. Mostly, Dr. Petty recommends crowns as a way to strengthen and protect compromised teeth from further damage, but our team can also use them to treat purely cosmetic flaws and as the finishing touch for dental implant and root canal procedures. When designing your new crown, we’ll be sure to take several factors into account to ensure we provide the ideal replacement, such as location, aesthetics, and personal preference. Then, once we receive the finished product from our trusted lab, we’ll place it with an exceptional amount of precision and comfort, making alterations until you’re fully satisfied with the final result. A bridge is a lifelike prosthetic that’s created to replace one or more missing teeth in a row, and its sturdiness and durability offers patients a much needed sense of permanence in their reconstructive solution. During your initial exam, Dr. Petty will take into account all the details concerning the color, shape, and size of your existing teeth so that we can be sure to create a truly seamless restoration. Once we receive the finished bridge, we’ll anchor it with the help of quality dental crowns that are placed over adjacent healthy teeth. You’ll quickly be able to start eating your favorite foods, speaking clearly, and smiling proudly again! Contact the dental office of John Petty, DMD today if you have any further questions for our team or if you’d like to schedule an appointment. We invite patients of all ages and even whole families to participate in our exceptional approach to precise and personalized care. Located in Tullahoma, TN, we also serve the nearby areas of Murfreesboro, Lynchburg, Shelbyville, Manchester, and beyond.